Airbnb and Uber are the two most prominent examples of how to apply the platform business model to the sharing economy. But there are countless other sharing economy platform businesses as you have seen last time in the explanation of types and examples. 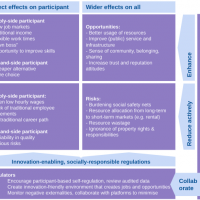 The sharing economy is one of the most significant socio-economic trends of the last decade. For innovators, it is still early days with countless ideas and opportunities to be discovered. But how do we innovate within a large trend? One of the most important aspects is to understand which business models are suitable to bring the strength of the trend to light. 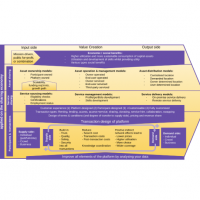 And that’s exactly what we are going to look at today: I am explaining the sharing platform business model using the value chain strategy tool! 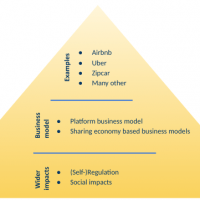 The biggest risks to Uber, Airbnb and sharing economy platform business models doesn’t come from technical or commercial dimensions but from their social impacts, yet these are being largely ignored. With a number of recent blows to both Uber and Airbnb in the US social and regulatory risks become crucial … understand what’s going on and how it may affect your ideas! Can Uber, Airbnb and sharing platforms self-regulate? The sharing economy is a fast-growing innovation opportunity. PricewaterhouseCoopers projects a 20-fold increase between 2016 and 2025 – reaching €570 billion ($674 billion). Its best know representatives are Uber and Airbnb. But there are many other wonderful examples and types of sharing economy platform business models. It is common understanding that the role of the innovator is to introduce new methods, ideas, products/services or business models. But does it end there? The answer is a resounding “no”. After having built one of the highest valued start-ups (by market capitalisation), Uber CEO and co-founder Travis Kalanick had to step down as top executive. The reason were not a lack of growth or bad financial results. It was due to the poor management of negative impacts of the platform. At the same time, Airbnb is awaiting dozens of regulatory decisions all over the world that can wipe off a considerable amount of their housing stock in the affected cities. Innovators have to understand and manage the implications of their ideas to participants and non-participants before a negative public opinion forms which would put pressure on regulators to introduce heavy-handed, innovation-stifling measures in place. Today we will look how innovators can help manage the foot print of their companies, the public discourse and regulations in a positive way using innovative ideas. Airbnb is a fascinating company. It is valued at $31b as of mid-2017 (pre-IPO). It has managed to exceed the market capitalisation of Hilton and Hyatt combined in less than 10 years since its start-up. They are serving over 3 million listings in more than 65,000 cities in over 190 countries and 200,000,000 guests to date. 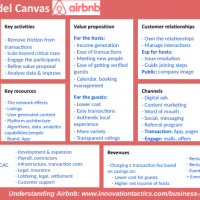 Today, we are going to have an in-depth look at Airbnb’s business model using the Business Model Canvas tool.